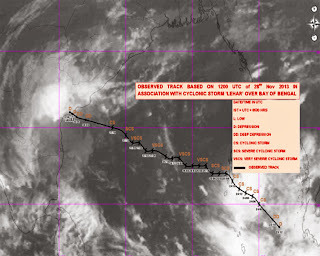 Visions of Hell: STH Stormwatch (29Nov2013) : Death of a cyclone; very severe cyclone 'Lehar' withers away. 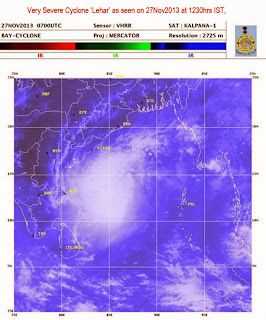 STH Stormwatch (29Nov2013) : Death of a cyclone; very severe cyclone 'Lehar' withers away. 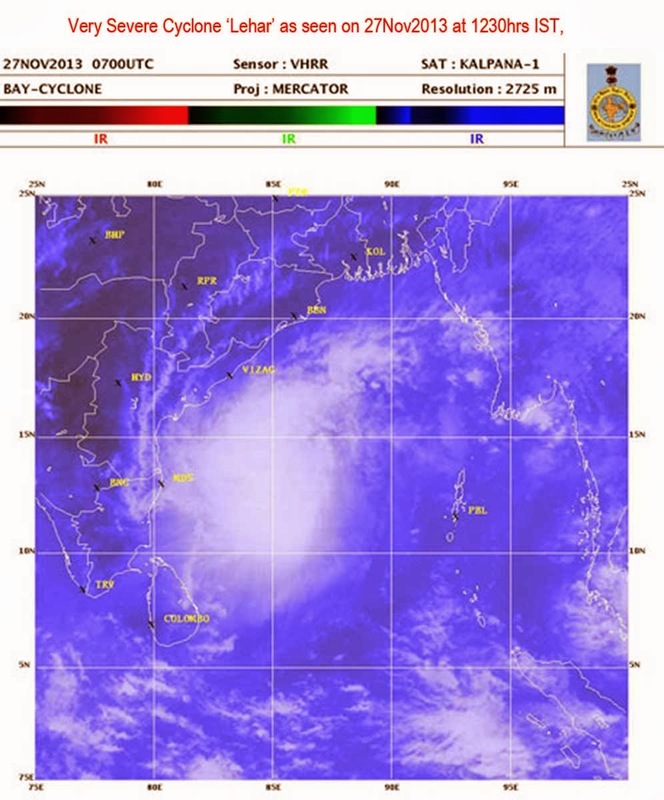 IMetD update : The depression over coastal Andhra Pradesh moved west-northwestwards and lay centred at 1730 hours IST of today, the 28th November 2013 over coastal Andhra Pradesh near latitude 16.00 N and longitude 80.80 E about 50 km southwest of Machillipatnam. It would move west-northwestwards and weaken further into a well marked low pressure area during next 06 hours. The decrease of SST (Sea Surface Temperature) caused by the onset of winter. The Andra Pradesh government evacuated more the 45000 people from coastal areas with 30 NDRF (National Disaster Response Force) and 450 SDRF ( State Disaster Response Force ) personnel being involved in rescue operations. The state government also opened more than a 100 relief camps. 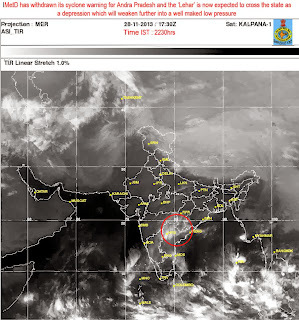 Thanks to both the atmospheric factors that influenced the weakening of the storm and the prompt response from the govornment 'Lehar' has not and probably will not claim any lives now.